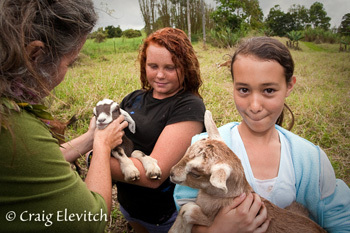 Kids with kids at Milk & Honey Farm, Pahoa. During the past several years, our Hawai‘i Island communities have become increasingly concerned about creating ecologically and economically sustainable, local food systems. There is a growing movement of educational, cultural, and commercial local food activities throughout Hawai‘i: new local-only farmers markets; school, home, and market gardens; campaigns for local food in retail markets; local food restaurants; agricultural workshops; and numerous other activities. 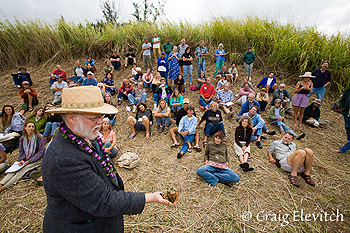 In 2008 and 2009 project co-director Craig Elevitch presented a one-year series of food security workshops on Kaua‘i, Maui, and Hawai‘i. They included four all-day Hawai‘i Homegrown Food Self-Reliance Workshops in Kona, Kohala, Puna and Ka‘ū districts of Hawai‘i Island, sponsored by the Hawai‘i County Resource Center. These workshops demonstrated a great demand for more information, knowledge, support and connection with the burgeoning sustainable food community on Hawai’i Island. Yet there existed no functioning network that linked these widespread activities for the purpose of sharing the accumulating knowledge and experience that was being generated by that community. John Jeavons leads a workshop in Biointensive gardening, Paauilo. The Hawai‘i Homegrown Food Network contributes to filling that gap. It grew out of a series of food security workshops, and with publishing the monthly Hawai’i Homegrown Food Network e-mail newsletter beginning in April 2009. It sought to answer the question “How can Hawai‘i Island feed itself?” and facilitate the implementation of those solutions, by providing a forum for the many activities and stakeholders that comprise our local sustainable food community.